At the end of December, I published my first Top 10 Cigar list containing two cigars out of Erik Espinosa’s La Zona factory in Esteli, Nicaragua. Coming in at the #7 spot was the Espinosa Habano and the #3 spot was the La Jugada Prieto by Moya Ruiz Cigars. Two fabulous cigars. Already having a huge respect for the product Erik Espinosa has been putting on the market, I waited in eager expectation since the first announcement of the “Warhead” earlier this year. Finally, after several months of waiting, I stumbled across this limited edition cigar at the local Spec’s, a wine, liquor, beer, cigar superstore. 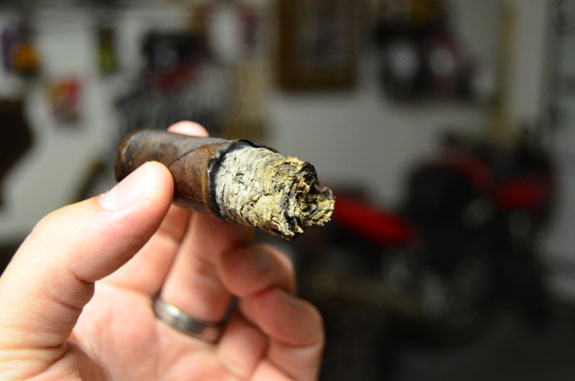 So, without further ado, I bring to you my first full review of 2014 of the 601 La Bomba Warhead by Espinosa Premium Cigars. Espinosa Premium Cigars is proud to announce they will be introducing a limited edition cigar for their full bodied 601 La Bomba line called “Warhead” at IPCPR this year. 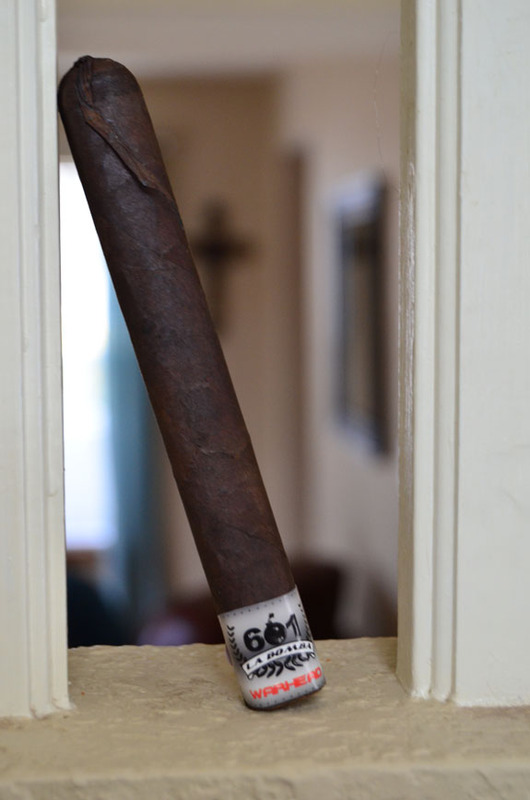 This is the first time the 601 La Bomba line is offered with a Connecticut Broadleaf maduro wrapper. The Warhead measures 6 1/2 inches by 54 ring and is semi-box pressed with the familiar fuse-like pig tail that is found on the 601 La Bomba line. “Although the wrapper is different, we are using the same powerful blend as the rest of the line.” said Erik Espinosa. 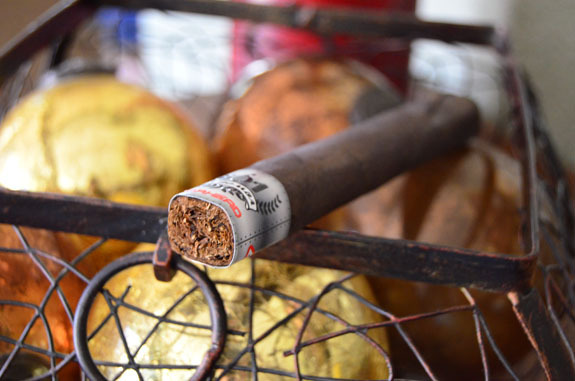 The 601 La Bomba line was first introduced in 2011 and is considered to be one of the strongest cigars in the market. 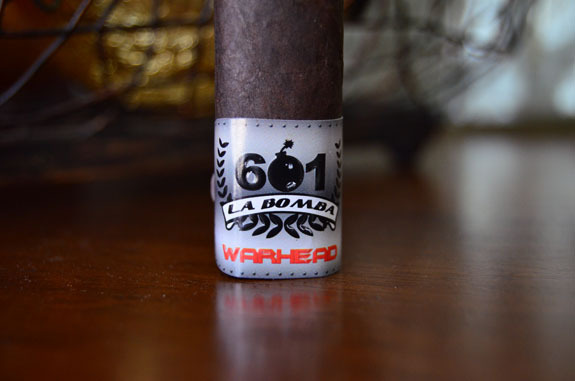 The 601 La Bomba Warhead sports a very dark brown wrapper that is consistent in color. Bumps and stitch-like veins are easily seen on the stick, which is common with Connecticut Broadleaf. A sweet pungency is noticeable on the wrapper aroma, while the foot gives off mainly notes of raisin and milk chocolate. I am surprised on the lack of pepper or any other spice on the aroma. A triple cap has been neatly applied and, like the original La Bomba, the cap ends in a two-inch fuse-like tail. Upon pulling off the fuse-like end and making a shallow cut, I find a decent draw that has only a tad more resistance than I usually prefer. I immediately note a spice warmth on the lips and in the mouth. The cold draw is rich with flavors of cocoa, wet cedar, dark fruit, and faint pepper. 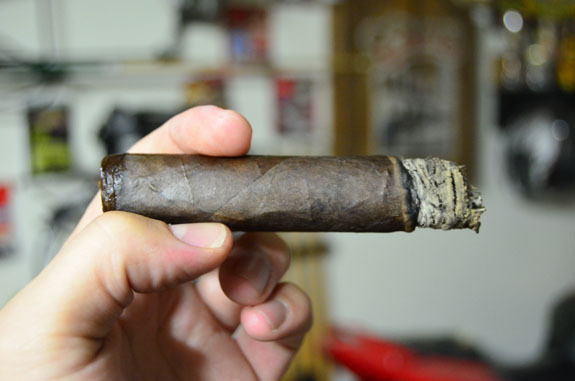 The foot band removes with ease and this 601 La Bomba Warhead is ready to be smoked. The Warhead starts off with some deep earth and cedar notes. While there is some spice in the profile, it is not nearly at the level I anticipated, but seems to be picking up as the cigar progresses. The retrohale is fantastic bringing forth some peppery spice and the finish shows off some dusty cocoa. The burn line began wavy from the get-go and required a touch-up in the first inch. I did take my time lighting the cigar but I’ll still take the blame for the wavy burn so early on. Due to the somewhat stiff draw, I made an additional cut to see if it would help with the smoke production that was lower than desired. I am not finding much relief with the additional cut. The ash is dark grey and flaky holding more than an inch. The burn line is thick and even as I conclude the first third. The dusty cocoa is more prevalent in the profile as I make my way into the second third, along with the cedar, and the earthy notes have taken a backseat. The cocoa is not sweet and I am interested to see if the sweet, milk chocolate I got off the foot aroma comes into play later on. The smoke is leaving my mouth a bit chalky feeling. I caught myself retrohaling the smoke every few puffs since I was enjoying the spice hit I was getting off of it but it is also causing me to feel a little nicotine kick. Since the first touch-up, I have not encountered any other burn issues. At one hour and twenty minutes, I have arrived at the last third of the 601 La Bomba Warhead. The profile has taken on a burnt cedar and diesel-like flavor. The pepper is also at the forefront of the profile. My mouth remains chalky and I am no longer picking up on the dusty cocoa. The smoke has become much richer as I get to my last few tokes. The burn line was wavy at the nd but did not require another touch-up. 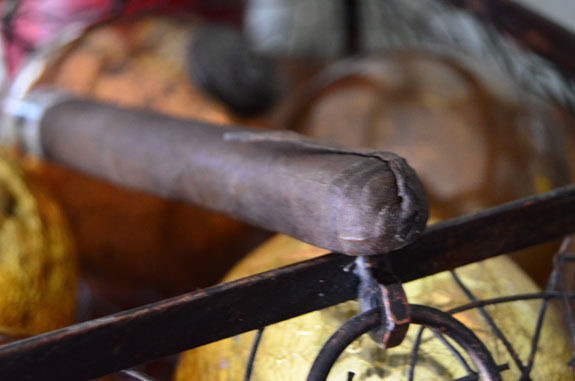 The strength continually increased throughout the cigar, ending in the full arena. When I think of limited edition cigars, my expectations immediately increase and I am not sure if the Warhead met those expectations. 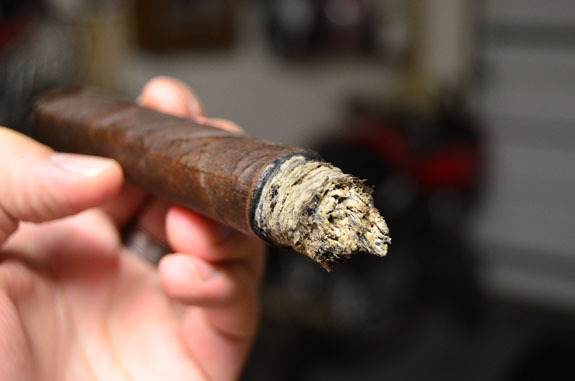 However, when I think of a cigar that I picked up for under $9, this cigar far exceeded my expectations…..I hope that makes sense. 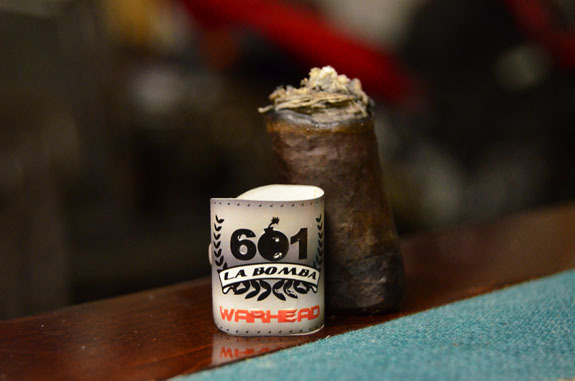 The 601 La Bomba Warhead is a great cigar that is not overly complex but delivers a satisfying experience. I enjoyed all of the flavors the La Bomba Warhead offered though I would have liked a little more sweetness in the profile. While the Warhead utilizes the same internals (binder and filler) as the regular La Bomba, it seems to be a completely different cigar to me. I will definitely be on the look out for more and I recommend that you grab some up as soon as you come across them. Thanks for not slacking it! I was really pleasantly surprised by the complexity of the regular La Bomba, after going into it thinking it was just going to be another all-strength stick. How would you compare this one to it? As always, thanks for the thoughtful review, and nice work with the new camera. I am actually a big fan of the regular La Bomba. The Warhead is way more toned down in the spice department and I would say that the Maduro wrapper muddled some of the flavors of the filler tobacco hurting the complexity of the stick, while the Habano wrapper on the regular La Bomba does a better job of bringing out the flavors and complexities of the filler tobaccos. The new camera has been a lot of fun. Still lots to learn. Thanks for the kind words. I too was anxiously waiting for these and after smoking 3 sticks, all of them had a awfully tight draw which ruined the whole experience. Sorry to hear that all of the Warheads had a tight draw for you. Out of the few I have smoked, only the one I smoked for the review had a draw that was a bit firm. If a draw is too tight I will usually just toss the stick. It is not worth the fight. Thanks for checking out the review.